Instant win contests are so much fun to enter and actually WIN! A large part of prizes I win are from instant win contests that are so easy to enter! Even using just a few of the tips you can increase your chances of winning instant prizes more often. READ ALSO : 5 Ways your FB profile is stopping you from winning. 1. Before entering any instant win contest take the few minutes to read the terms and conditions of the contest, so you know what your odds are and other small details. Some instant win contests will go as far as to tell you certain dates that certain instant win prizes will be set to go off in the algorithm. 2. Enter as often as allowed - Most instant win contests set a 24 hour period limit before you can enter again for your chance at winning a prize. Many though do allow you to come back every few hours or to enter twice a day to win an instant prize. XBOX ran an instant win contest a few years ago that you could enter every 4 hours! Those are exciting instant wins contests to take apart of. 3. Disable your ad and pop up blockers. 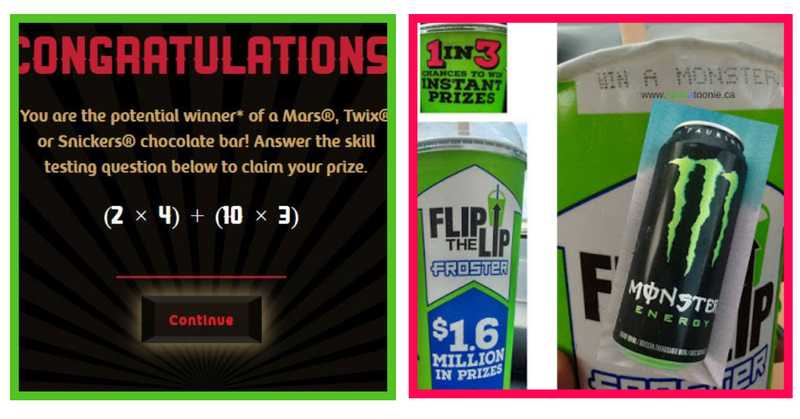 Almost all instant win contests have a pop up system to alert you that you have won a prize. Take the few seconds before entering any instant win contests to make sure you don't have a pop-up blocker active. If you miss the pop up that you are a winner, you may end up losing out on that prize. 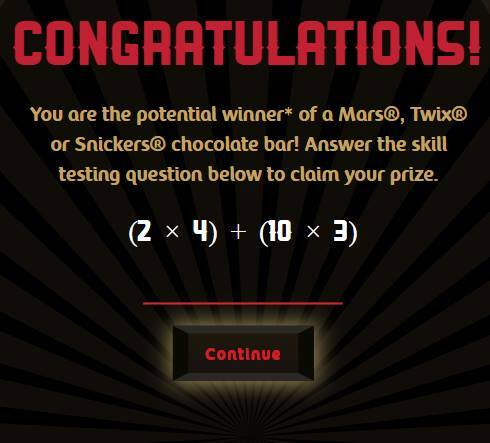 The pop up in the Mars contest from last year had the skill testing question to claim my instant win prize. 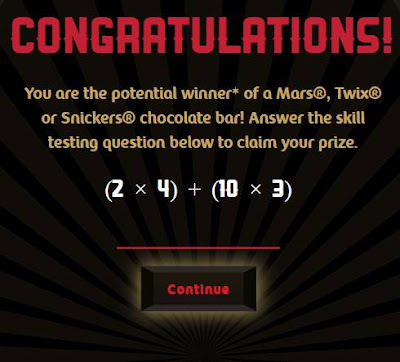 If that pop up had been missed, even though I technically won, I wouldn't be getting a prize becasue I wouldn't have answered the mathematical question and completed the actual win. 4. Time of entry matters. Common times during the day many people are entering to win an instant prize, which actually makes it much harder to score an instant prize. If you really want to win a prize being offered in an instant win contest, make sure to enter at the most random OFF times. 2-4 am are great times to score an instant win prize. Just before midnight as well has proven to be very effective in winning an instant prize. 5. Pin-Code instant win contests - Pin code contests can really offer some great high value prizes but entering them at the right times is very important. Do NOT enter more than one pin code at a time. So if you have 4 pin codes for a chance to win an instant prize, enter only one per day and at all different times. I can't even count how many instant win prizes I have won with pin codes by entering them in the very last hour of the contest. Patience is sometimes a virtue in contest winning. 6. Mobile VS desktop - Before entering any instant win contests the rules are a must. MANY especially Facebook based instant win contests don't allow entry from a cell phone. Each instant win contest performs differently and trying different browsers can also help. Good luck in every contest you enter & to see the amazing prizes Canadians are winning everyday join us in the private My Canadian Mailbox FB group.